I am a member of several cooking discussion forums, including Pantry Challenge Yahoo Group and Discuss Cooking. It’s not too uncommon for folks to ask questions along the lines of “I just bought a bunch of radishes. I put some in my salad, but don’t know what to do with the rest. 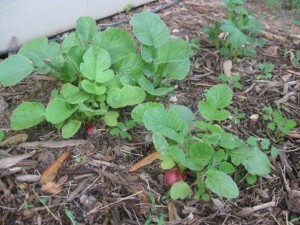 How do you cook/prepare radishes?”. I find this quite interesting. When I was growing up in Slovakia, the main use for radishes (reďkovky) was: sandwich topping. Bread topped with slices of this root vegetable known for its tangy, sharp flavor, makes for a great light breakfast, especially when coupled with a glass of warm milk or hot chocolate. There is not much to this “recipe”. 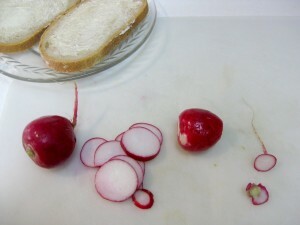 Wash the radishes, cut off the ends, and slice into pieces about 3 mm thick. 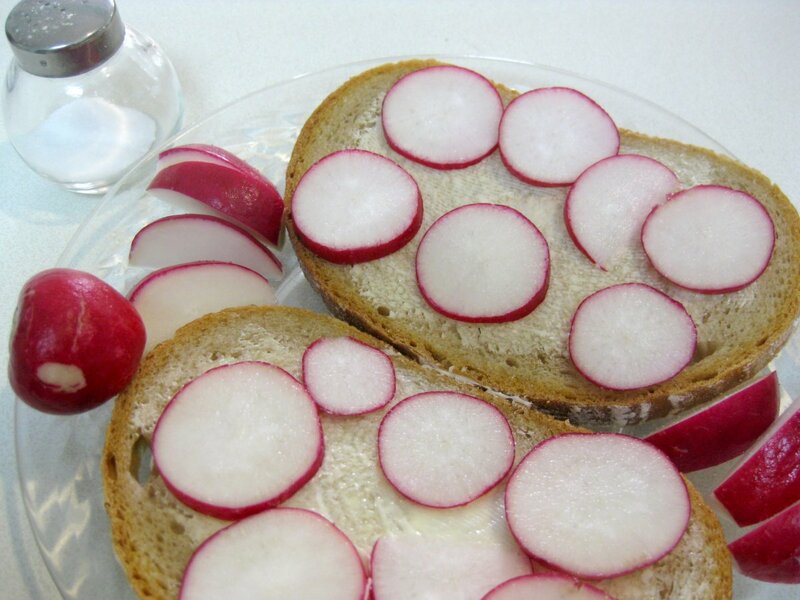 Spread butter on a slice of good wheat bread, top with radishes, salt, eat. That’s it. As a side note, radishes are extremely easy to grow! I had two small 6×3 foot plots at my previous house, and without knowing anything about gardening, I planted bunch of radishes (and also tomatoes, potatoes, strawberries, dill and onions). This small garden supplied me with fresh veggies for most of the summer. My Slovak host family made this for me this year… I was like “okay….” It tasted fine; I’d never had radishes before, but the crunch on bread threw me off a bit. Hi Steph, so before you had this at your Slovak host family, did the thought ever occur to you to put radishes on bread? 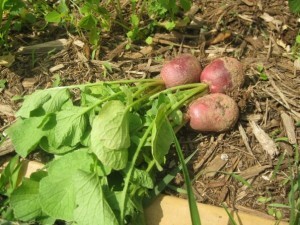 How did you prepare radishes in your family? I find this sort of stuff quite fascinating. To me, when I see a radish, the first thing that comes to mind is this this radish sandwich. However, it clearly is not very universal. I guess your experience was little similar to mine in 2005, when I went to Tanzania to climb Kilimanjaro and go on an African safari. On the safari, we were served, daily, sandwiches consisting of bread, butter, and grated carrots. I found that very strange, probably in the same way you found this radish bread in Slovakia. Wow, this brings back alot of memories. I only found this website through accident but am glad I did. I spent about 2 yrs in SK, 99-01. Lived in Trencin and Modra. In Trencin, I used to to get my chlebicki for breakfast every morning, and man do I miss that. I married a Slovak woman, speak, read and write Slovak, and have about 7 Slovak cookbooks. If any questions, I am more than happy to look recipes up for you. Dobru chut! That’s awesome, Lance. It’s really great to meet Americans (I presume) who appreciate Slovakia enough to learn the language and culture. Which cookbooks do you use? All recipes on this site come either from my family, from “Recepty Starej Mamy”, “Slovenska Kucharka”, or from the Internet (mimibazar.sk is a great resource). Speaking of chlebíčky, no recipe here yet, but I’ll be definitely posting those in the near future. Yes I am American. I also have Slovenska Kucharka, the big book, and then a series of cookbooks called Recepty na Zivot. And one Bajecne recepty na party. I look forward to seeing more of your recipes! Lance, that’s amazing that you could learn Slovak so quickly! I also lived in Slovakia (Piestany and Bratislava) for 3 years and married a Slovak man. I never quite got the hang of mastering the language though. My husband and I love this website because I can finally cook Slovak recipes without needing the instructions translated! Our family has always eaten radishes, mmmm, but not on bread with butter…. so easy, ( onions, though, yes ) definitely something to try, why not ? maybe I will even try the shredded carrots. Our family, has always eaten radishes sprinkled with salt, but never a radish sandwich. I will definately try this though. why not? this brings back memories! i love your website! our family would eat this on rye bread but with goose or duck fat instead of butter and some salt on top! yum! yeap, that’s exactly what I do and yam with the duck fat. I thought my American kids to eat that too. Just had some last week. 🙂 My wife thinks this is the weirdest thing but I love the refreshing crunchy texture.